Sir Dancealot showed a neat turn of foot when scoring at Glorious Goodwood and can follow up in the Ladyswood Stud Hungerford Stakes at Newbury on Saturday. David Elsworth’s four-year-old put up a career-best performance when getting up in the last stride to lift the Lennox Stakes after looking set for minor honours at best. He looks set to register a second Group Two success in under three weeks despite having to carry a 3lb penalty. It seems Sir Dancealot is still on the upgrade, which is partly down to a gelding operation and is helping him fulfill his potential. Raymond Tusk can continue his improvement by winning the Irish Thoroughbred Marketing Geoffrey Freer Stakes. It came as a surprise to many when the colt, owned by Middleham Park Racing, was supplemented for the Coral-Eclipse last month on the back of just two career starts in ordinary company. The three-year-old, trained by Richard Hannon, did not run at all badly in filling sixth place behind Roaring Lion and reaped the benefit of that tall order with a cosy success in the Listed Glasgow Stakes at Hamilton just two weeks later. Middleham Park and Hannon can also strike with the unbeaten Boitron in the Denford Stakes. The son of Le Havre has created good impression with wins on this course and at Doncaster. He can take this Listed prize before going on to better things. Spring Loaded looked a shade unlucky in the Stewards’ Cup and can bounce back with victory in the William Hill Great St Wilfrid Handicap at Ripon. Paul d’Arcy’s speedster had been a strong fancy for the big sprint at Goodwood on the back of a convincing display at Ascot, but he got going too late and was a never-nearer seventh behind Gifted Master, beaten only two and a quarter lengths. He was found to be lame afterwards which made his effort more meritorious. Spring Loaded should take plenty of beating as long as takes to the track. The consolation race, the William Hill Silver Trophy Handicap, can fall to John Quinn’s bang in form Mr Wagyu. 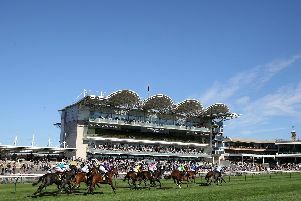 Kuwait Station can make it three wins from four starts in the William Hill Ripon Hornblower Conditions Stakes. A winner on this course and at Catterick, the only blot on the David O’Meara-trained youngster’s record was when he was well-beaten in the Coventry Stakes at Royal Ascot. He can be forgiven that. Victory Angel has always been well thought of by Roger Varian and can gain a first win of the season in the sunracing.co.uk Handicap at Doncaster. He ran in the Commonwealth Cup last season, although a big outsider, and on his return to action this time around he was only a length off subsequent Stewards’ Cup winner Gifted Master. This step up to seven furlongs might just help him out. Buccaneers Vault was only beaten half a length when fourth in the Randox Health Grey Horse Handicap 12 months ago on soft ground at Newmarket. With conditions likely to be more suitable this time, Paul Midgley’s six-year-old can lift the prize restricted to horses of that colour. CHEPSTOW: 5.10 Airglow, 5.40 The Establishment, 6.10 Jaganory, 6.40 Bounty Pursuit, 7.10 Kenstone, 7.40 Lady Valdean, 8.10 Rainbow Jazz. DONCASTER: 1.15 Groupie, 1.45 Ghost, 2.15 Arctic Fox, 2.50 Field Gun, 3.25 Victory Angel, 4.00 Classic Pursuit, 4.35 Tobruk, 5.05 Berlusca. NEWBURY: 1.50 Boitron, 2.25 Raymond Tusk, 3.00 Rogue, 3.35 SIR DANCEALOT (NAP), 4.10 Sextant, 4.40 Zzoro, 5.15 Outofthequestion. NEWMARKET: 2.10 Khaadem, 2.45 Staxton, 3.20 Buccaneers Vault, 3.55 Star Terms, 4.30 Great Hall, 5.05 Eskendash, 5.35 Thechildren’strust. PERTH: 1.55 Henry Smith, 2.30 Make My Heart Fly, 3.05 Trongate, 3.40 Parthenius, 4.15 Uptown Funk, 4.45 Red Giant, 5.25 Keep The River. RIPON: 1.30 Off Piste, 2.05 Mr Wagyu, 2.40 Kuwait Station, 3.15 Spring Loaded, 3.50 Double Reflection, 4.25 Mikmak, 5.00 Dr Richard Kimble. TRAMORE: 4.20 Zarena, 4.50 Remmy D, 5.20 High Mounte, 5.50 Solar Heat, 6.20 Bronagh’s Belle, 6.50 Days Without End, 7.20 Rightdownthemiddle.